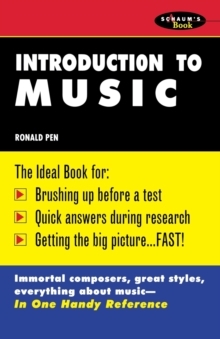 This work presents a comprehensive review of the material covered in "Introduction to Music" courses in colleges and universities. Such music appreciation courses are intended primarily for non-majors. In keeping with the courses' content, this review book covers the "elements" of music and provides a historical survey of music. The book is formatted in such a way as to provide college students with the essentials of the subject, and to supplement the regular assigned reading.